Arm yourself, hero! An army of enemies lies in wait on your land, preparing a load of trouble for the kingdom. It’s up to you to head off their deadly plan and make them regret ever setting foot near this soil. With your unmatched cunning and bravery, no opponent will stand for long. 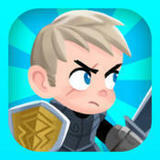 Ready your thumb, courageous knight, and tap onward to victory! A time tap roleplaying adventure, Combo Heroes combines classic elements of your favorite RPG with unique time-tap gameplay that’s both easy to play and challenging to beat. You’ll scour the kingdom for enemies in your midst, bringing the battle to them and claiming sweet victory as you tap the sliders for slash and defense. There are many tough knights for you to collect, and they’ll only get hardier as you upgrade their physical damage, health, and combo attack damage. Collecting artifacts and knights will enhance your abilities, and there’s even a special character to unlock. Yet, no matter how high you upgrade your knights, never take your eye off the prize; your enemies may be tough, but the bosses will always make sure you don’t leave unscathed. Featuring a simple one-touch interface, you can play one-handed as you only need one finger to win. Each tap of the screen unveils sound effects that put you in the action, and the graphics will bring your deadly battles to life. With tons of stages to play, lethal knights to upgrade, and awesome treasures to uncover, Combo Heroes provides gameplay that’s both endless and addictive. - One-handed interactive play: just tap the screen! - Unlock a special hidden character to play!